Christmas Living Room Decor | Bring the Christmas Joy into Our Living Room! 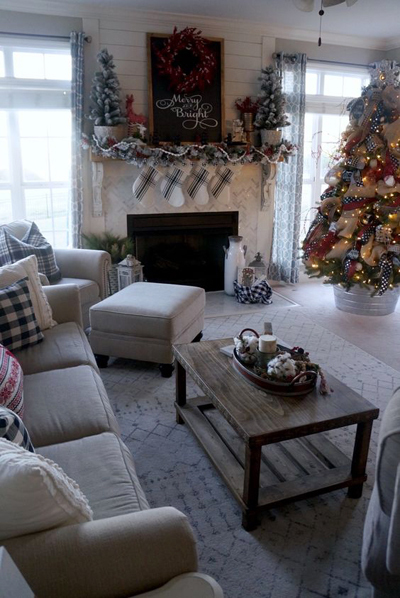 In every home, the living room must be the main stage when it comes to a big event like Christmas. It is the place of most houses place their Christmas tree, opening the Christmas gifts, and gather together with the whole big family and friends to celebrate this event. 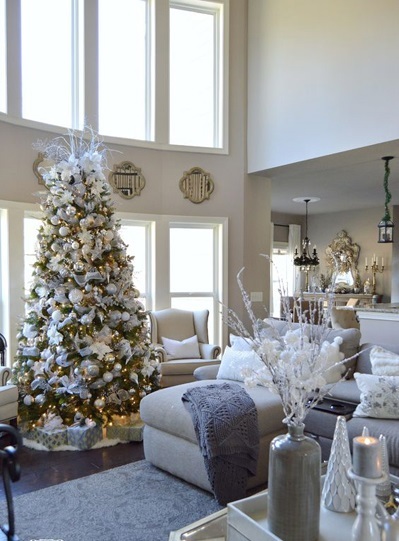 That is why the Christmas living room decor should get a big attention to create a more joyful Christmas atmosphere. So now, let us check out some examples below. 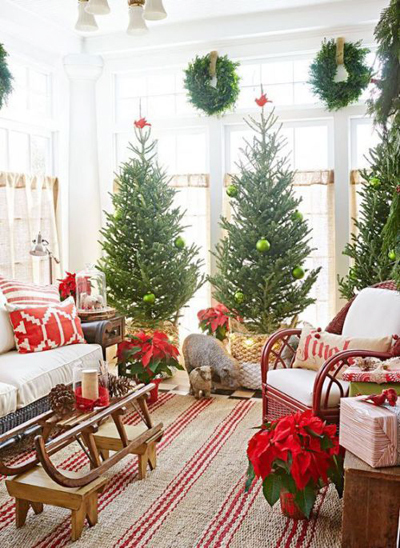 In the first picture, we can see that in decorating the living room with the Christmas theme, we do not need to make it looks too complicated. 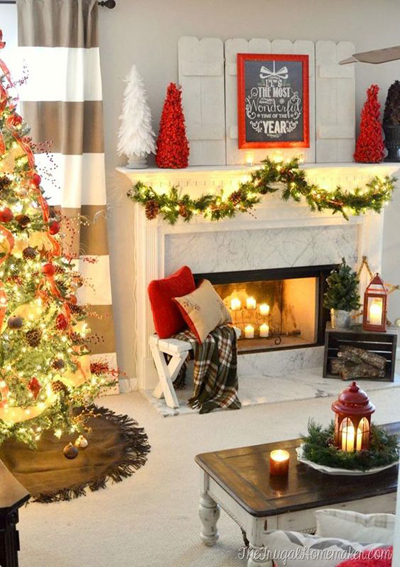 Make a simple one is enough to create the Christmas atmosphere in the living room. 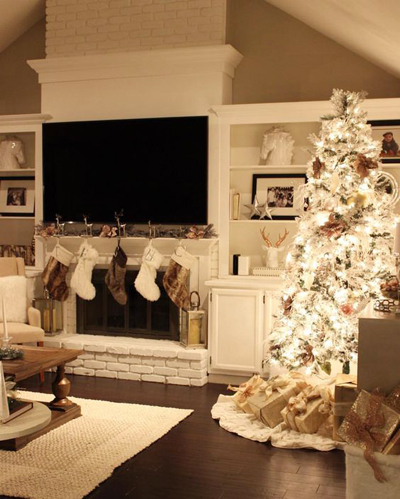 We can place the tree at the corner of the room usually, near the window and fireplace like that. And for the fireplace, we can place some mini Christmas tree on top of it and hang a wreath to make it more beautiful. As we can see in the second picture, the tree is placed in front of the window and next to the fireplace. If we have a lot of gifts to be shared and opened, we can place them around the tree’s leg to beautify its display. Then, we can hang some Christmas socks on the fireplace and give some other decorations on top of it such mini tree, lights, and the NOEL sign like on the picture above. Most of the living room decor for the Christmas event only focussing on the tree and the fireplace (if we have) especially for the one with a small space. 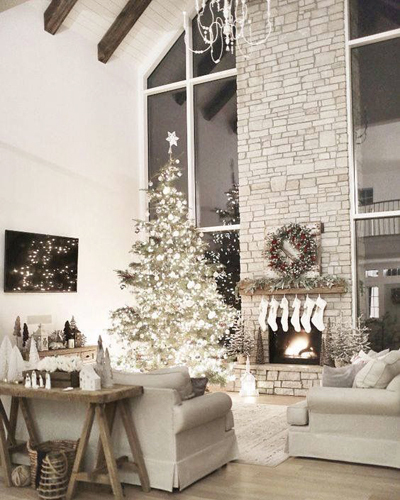 The tree placement is really important and most of the people tend to choose the tree near the window and fireplace is to give the warmth while celebrating this event with the whole family. 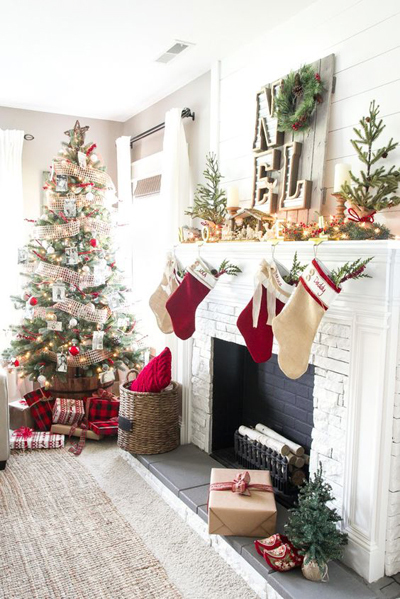 Similar to the two previous pictures above, socks, wreath, and mini tree are used to decorate the fireplace. If we like a more simple decor, we can follow this example. 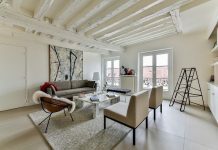 Here, the decorations and things used to decorate this small living room are not too many. 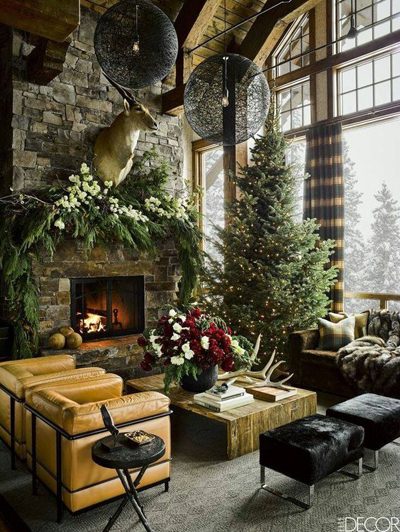 As we can see, there is just a Christmas tree at the corner of the room, some simple socks which hang on the fireplace, and two deer statues, one on the top of the coffee table and the other one is next to the sofa. Although the decor is really simple, the atmosphere still can be felt. Besides the Christmas tree, socks, and wreath, we can also place some a carpet under the table to increase the warmth of the room. As we know that during the Christmas, the weather is really cold. Then, we can also place some other decorations on top of the table like the ones that we can see together from the picture above. 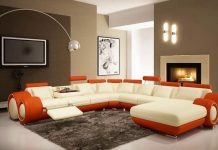 If we have a large living room to decorate, it does not mean that we have to do a lot of decors or even place so many decorations. We can place a big Christmas tree like the example above to fit the room size and we can put it in the middle of the living room around the single-sitting sofa with some gift boxes under the tree. 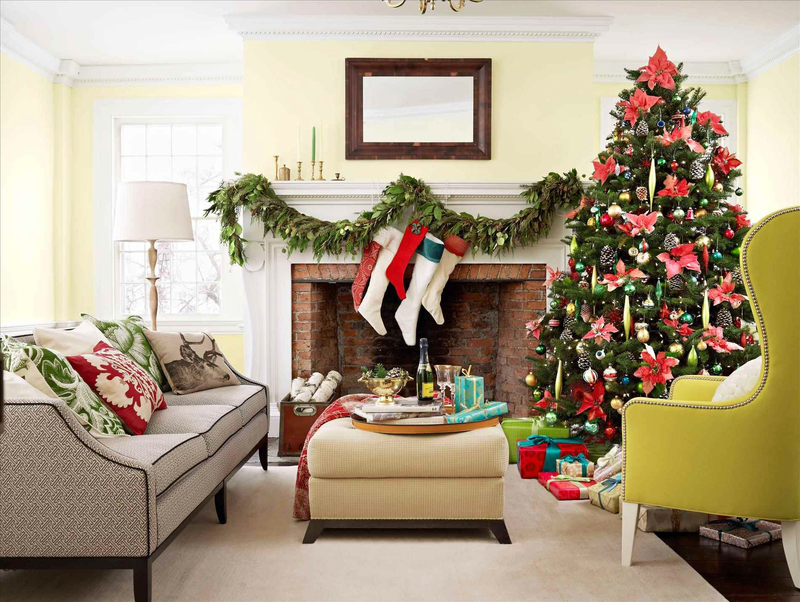 Similar to the living room which has a smaller size, the one with a bigger size often place the tree near the fireplace like this one. And the fireplace itself also decorated with some Christmas socks with a white and gold color. Then, it beautifies with a wreath on top of it. 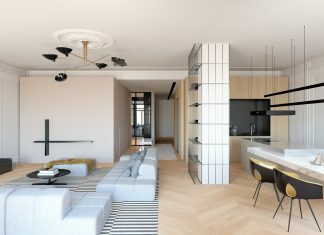 The decor is really simple, is not it? Again, a Christmas tree near the window and fireplace. This decor has become a tradition for a lot of people. 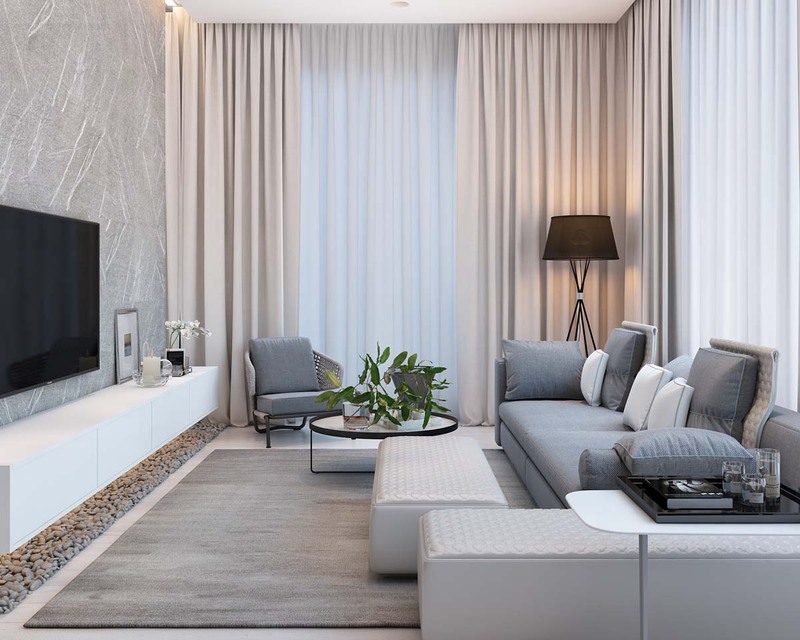 No matter how big the size of the living room or how does it look alike, placing the tree in that position is like a must. 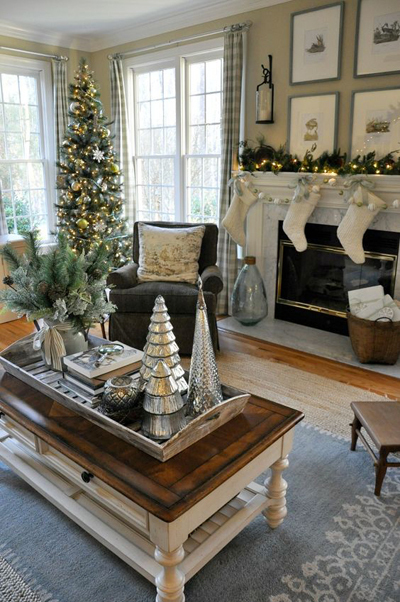 Not to forget the wreath and socks which hang on the fireplace to make it looks great. Even if we have a living room with a rustic style concept like this one. The tree is placed in the corner near the fireplace and window. The table in the middle and surrounded by the sofas. There is also a greenery which put on the fireplace which absolutely makes it looks magnificent. The last but not least. The Christmas atmosphere in this living room is very exquisite. Using three Christmas tree at once in front of the windows, using the wreath around the living room wall, using Christmas-themed pillowcase, and put some red flowers on the floor. The Christmas atmosphere is really felt with a living room with this kind of decor. Those are the Christmas living room decor that we can share with you. Hopefully, all the information that we have shared above will be useful for you in decorating your living room in order to welcome the Christmas event. Previous articleChristmas House Decoration Ideas | Let’s Decorate Our House to Welcome the Christmas Event!